You Are Here: Home » Body Treatment » Medical Body Shaping – Its Treatments And Who Should Go For It? There are multiple options available for body shaping and surgical liposuction, laser liposuction, injection lipolysis are some of them. 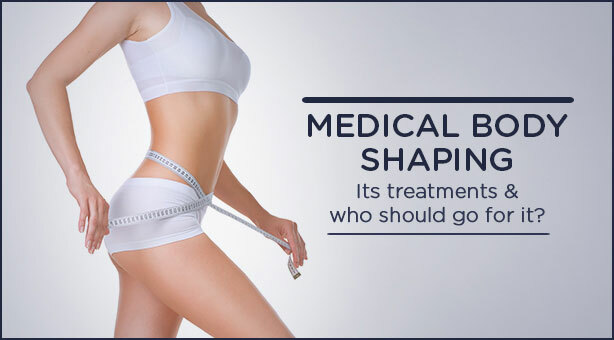 Patients, who are unwilling for surgical options or are unfit for any invasive procedure because of uncontrolled diabetes, heart disease or any other serious health condition, can opt for medical body shaping options. This treatment involves non-invasive Lipolysis with HIFU Ultra sound and Accent non-ablative radio frequency. These high intensity ultrasound and radio-frequency waves mobilize fat cells, destroy them and facilitate their expulsion from the body through lymphatic drainage. These techniques especially give good results for facial fat reduction and contouring the face. It is a highly precise medical procedure that applies high-intensity focused ultrasound energy which delivers heat to the deeper layers of the skin. This triggers collagen remodeling thus increasing the elasticity of the skin resulting in tightening. It also destroys excess fat cells in the face, neck by heat energy. These dead fat cells undergo a process of cellular death called apoptosis and then expelled through body’s lymphatic drainage. Unipolar (or 3rd generation Monopolar) one is for a deep controlled penetration depth of the RF energy for fat reduction and cellulite treatment. Results may last up to 2-3 years. However, ongoing maintenance will be required more frequently for older people and for those with poor skin quality to begin with, as a result of smoking, sun exposure, alcohol consumption etc. For body contouring applications, the improvement in the skin quality is said to be long lasting, similar to the facial tightening results; however keeping the body contours in check is also subject to a person’s diet, calorie intake, exercise and lifestyle. Fat cells have the capability of expanding to 500 times their size, thus an unbalanced diet and unhealthy lifestyle plays a center roll in keeping body contours in good shape more than any treatment can, effective as it is. Body contouring is an area of medical aesthetics that is developing rapidly, with many new devices coming to market every year, using multiple different technologies. For these treatments, patient selection is probably the most challenging. The choice of equipment for an individual practice will depend on a variety of factors, including cost, patient demographics, space available and staffing levels.